We have already detailed the install and initial impressions of the Savvy Offroad bumpers here. With everything that life has thrown at us lately we had not yet gotten back to writing about the off road capability improvement. The other half of not writing about the off road capability is there isn’t much to say. 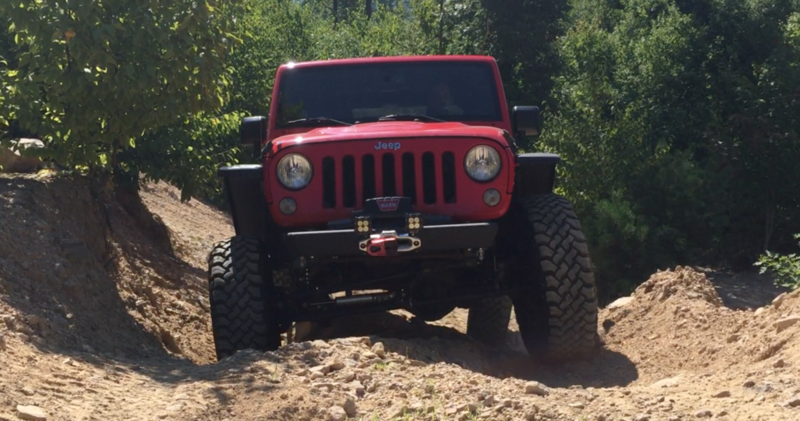 The bumpers are better in every single way than the stock setup when you are off road. They are a significant improvement over the factory Hard Rock bumpers we had and when compared to most aftermarket bumpers the approach and departure angle improvement is unmatched. The Savvy bumpers are lighter, with better ground clearance, less weight, and have integrated recovery points when compared to stock bumpers. What makes the Savvy bumpers really technical is the ability to still mount a full size winch like the Warn ZEON while gaining all that clearance. You can see in the picture how much more clearance there is. Short of cutting off the entire front of the frame you aren’t going to get anymore approach angle out of a stock axle location. What this meant on our latest trip was never worrying about hitting any obstacles. You can see how often I hit the front plate on the old bumper by how mangled it looks. The same goes for the rear bumper. Coming off obstacles is less tense, once the tires drop off there is nothing to worry about. It’s still possible to hit the bumper, there isn’t a bumper made that won’t hit an obstacle with the right conditions. We are merely saying it would take a lot to tag it, and you will probably hit something else first. The only oddity with this setup are found with the d-ring locations. They are on the underside of the rear bumper and the front winch plate. They work perfectly fine but whenever you hook up to them the hook, or link impacts the bumper. With the advent of soft shackles this is less of an issue and something we plan to test for durability when connected to the Savvy bumpers. I find a bumper review like this difficult to write. There isn’t a lot to say and the bumper does exactly as advertised. They provide some of the best approach and departure angles in the industry while providing strength, durability, and looking stylish at the same time.